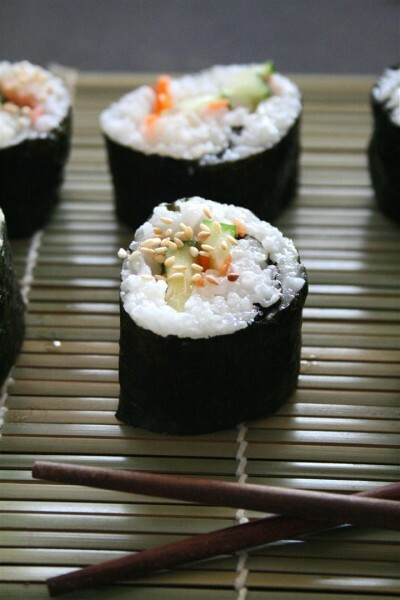 Vegan Sushi was posted on April 28th, 2011 and is filed under Dairy Free, Gluten Free, Main Dishes, Recipes, Vegan, Vegetarian. This entry has 19 comments. You can follow any responses through the RSS 2.0 Comment Feed. Our mall just got a sushi place. I’m kind of excited. Not only do they have magnificent sushi, but yam fries, shrimp…and be still my heart…bubble tea. Yah. Next shopping trip I know where I’m having lunch, hungry or not. So I’ve been thinking about sushi and those thoughts have driven me to a lunch of a homemade version. It was really fun to make…I can’t wait to make other varieties of sushi now that I know I can do it. There are soooo many ways to do sushi, by adding different strips of veggies, adding a protein like tuna or imitation crab, stuffing in some avocado (we were out! Sniff), or by using different condiments. I like the itty bittiest amount of that green wasabi paste and pickled ginger on mine. Lots of pickled ginger. The way I make it means there’s no fat, sugars, or cholesterol. But here’s the recipe I did today…hope you enjoy! First of all, cook your rice. You can cook it like normal rice but the ratio is 1 cup of rice to 1 ¼ cup of water. 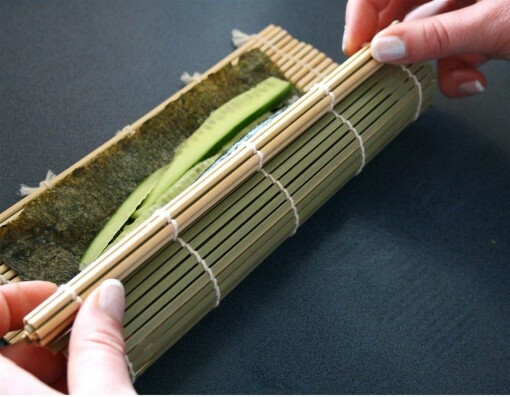 Get out a bamboo sushi mat and place the seaweed (shiny side down) on the mat. Spoon about 1/3 cup of rice onto the seaweed and pat it down with wet fingers. 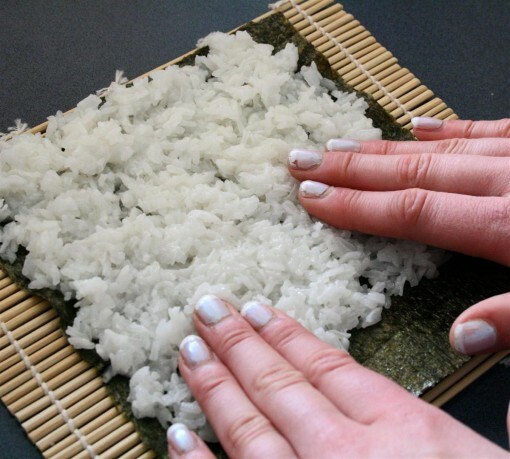 Leave one inch (on the bottom of the sheet) without rice. Then add soy sauce and rice vinegar (equal amounts) by sprinkling it lightly over the rice. Add your veggies by lining them up in rows, close together. 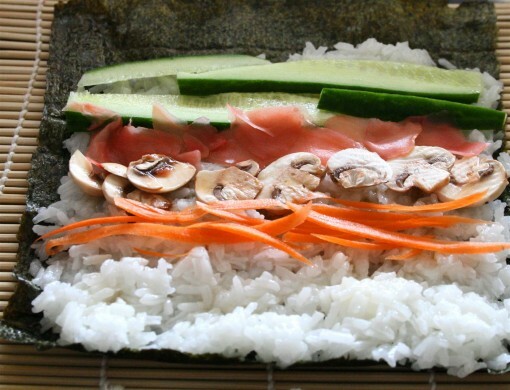 Roll it up using the sushi mat. Hold the edge of the mat with your thumbs, then lift the seaweed and roll the sushi away from you. Make sure to keep the ingredients in place and that the rice sticks together. And then you slice it up into 5 pieces and top with a barely there sprinkling of toasted sesame seeds. Mmmm…I dipped mine into some more Bragg’s soy sauce and topped it up with more pickled ginger. To up the nutrition I’d like to make it with brown rice, but brown rice isn’t that sticky, so I’m not sure if it would work. Nonetheless, I can’t wait to make sushi again! Such a fun food! Today: I am hoping to run a 4 miler today, just a short run. And…I’m making a special recipe for tomorrow in honour of Kate’s wedding! I guess I’m such a girl, but I’m kind of excited about the wedding! My next post will be very English. *grin* If you’re interested in keeping up with Colourful Palate and don’t want to miss a post, subscribe here! Have you made sushi before? What ingredients did you put in yours? Have any of you tried using brown rice? I’ve never tried making my own sushi before. Yours looks just perfect!! Mmmmhhh vegan sushi! You are super creative and skillful in making these! Thanks Deborah, you should try it! Lenna~ Aw, not sure I deserve that, but I’ll take it, lol. Thanks! I have not tried making sushi yet but it has been something on my to make list for many years now. Not sure why I have not given it a go yet ;) maybe soon I will actually get around to making it; yours looks great!!! 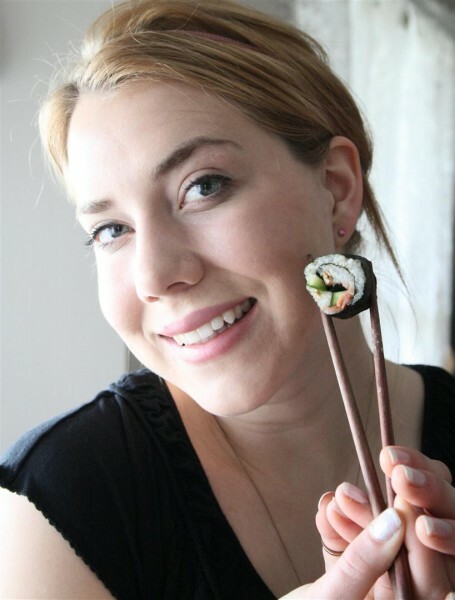 Carissa… Thanks for stopping by Jolly Vindaloo… this sushi looks so yummy i want to grap my chop sticks and reach for one… I have never made sushi before but will have try soon! 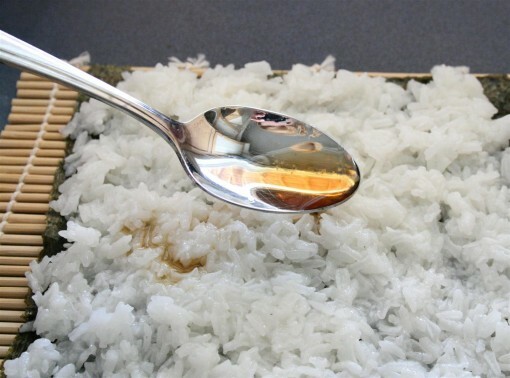 I recommend adding the vinegar and a teaspoon of sugar to the rice as it cooks rather than sprinkling it on. It’s how I was taught to make sushi rice (never heard of adding soy sauce to sushi rice…), and it flavors the rice all the way through. – also, you can try using California short-grain brown rice. You could try medium-grain too, but I think that it would require a pressure cooker. I’d go with Gomasio instead of just sesame seeds. Adds a bit of flavor!